Stocked with fresh catches from Chesapeake Bay, Main Street restaurants in Annapolis offer locals and visitors some of the finest seafood found anywhere. Operating from these aged and tall storefronts, chefs dish up top cuisine at outstanding seafood restaurants while patrons enjoy unique decor and tantalizing smells. Wherever you go, the restaurants in Annapolis present variety to satisfy every palate. 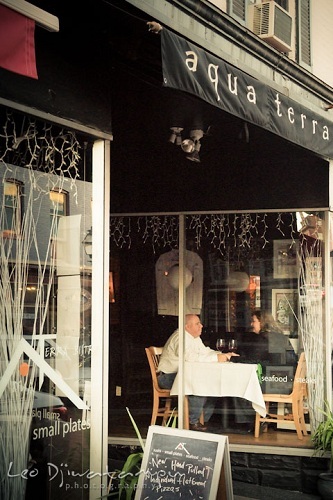 For an upscale experience with the sweet sounds of live jazz in the background, check out Aqua Terra at 164 Main Street. As a seafood restaurant with Italian and Asian flair, Aqua Terra serves up everything from sushi to pizza. The Tempura Crunch Roll is a sweet bite with pineapple and shrimp, while Tyler’s Fire Roll steps it up as spicy sriracha is paired with salmon, cream cheese and flying fish caviar. Reservations are recommended, and you’ll fit in with business casual or a notch higher. Sushi averages about $10 a roll, while entrees run about $25. 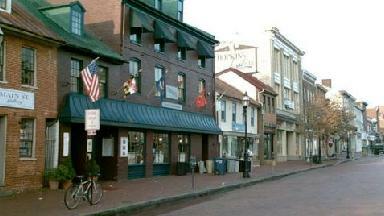 Another in the series of good restaurants in downtown Annapolis is O’Brien’s Oyster Bar at 113 Main Street. The building dates back to the American Revolution and patrons are surrounded with images of local history and the Naval Academy. But this seafood restaurant will quickly bring your attention back to the table with its top cuisine. Start with the luscious Cream of Crab Soup and move to the Colossal Crab Cake on a bed of pilaf and fried green tomatoes. The restaurant menus for brunch and dinner include other inventive fare, from Crab Benedict in the morning to Rockfish O’Brien’s, a dinner plate of striped bass topped with crab and asparagus. Entrees start at $20, but sandwiches and bar food are comparable to chain restaurants. 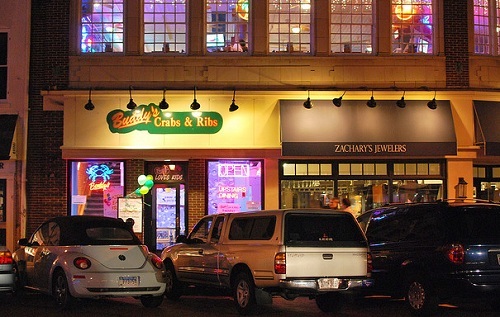 For a straightforward fish restaurant in Annapolis MD, you’ll get your fill at Buddy’s Crabs and Ribs at 100 Main Street. The buffet lines are open daily, or order off the restaurant menus for salads, seafood and sandwiches. Prices depend on your tastes — you can pay about $15 for the Big Buddy Crab Cake sandwich or $45 for a plate of King, Alaskan and blue crabs. Kids under 10 eat for free. Buddy’s is extremely casual and inviting. 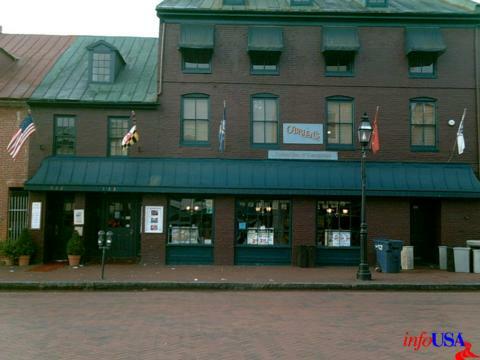 While different preparations of crabs are the Main Street specialty in Annapolis MD, this local dining guide offers more than just seafood restaurants. Piccola Roma, 200 Main St., steps out with heavy doses of cream, herbs and fresh ingredients to plate classic Italian dishes. The Veal Saltimbocca lives up to its name by exciting your taste buds with a tangy sauce including prosciutto and sage. And just in case you prefer to call it a fish restaurant, Piccola offers a variety of stuffed ravioli, risotto and pasta dishes with scallops, shrimp and crab. Expect to pay $15-25 for a main dish and come as you are, as the white linen dining room has a feeling of home. 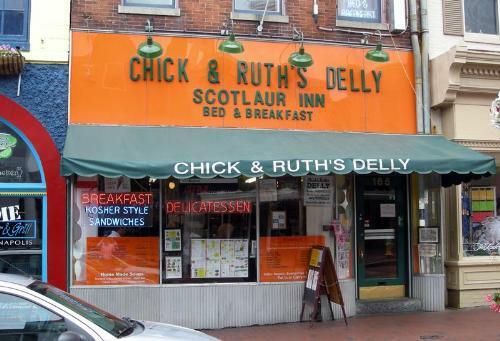 And perhaps no trip to see the good restaurants of Annapolis would be complete without a stop at Chick and Ruth’s Delly at 165 Main Street. It’s Americana at its finest. Come in the morning to say the Pledge of Allegiance with a crowd, or stop in the afternoon and freeze your brain with a 6-pound shake. You’ll find burgers and crab cakes here, and it’s reported you can even get something green like a salad or wrap amid this meaty decadence. 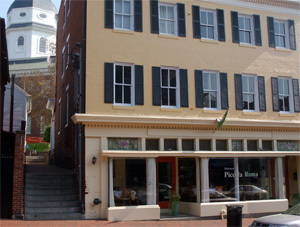 For anyone in the Main Street area, wandering the historic Annapolis cityscape and finding themselves on the peckish side, there are many great dining options available. Fish is a natural favorite for the area and rightfully so, but there are plenty of dining choices available in the Main Street Area.